James Harden leads Houston to a Game 5 win over Utah, scoring 26 points, six rebounds, and six assists. In Utah, the Jazz space the floor, allowing Ricky Rubio to set up Georges Niang. Kyle Korver vacates the baseline creating space for Rubio to drive off a ball screen. Joe Ingles and Georges Niang space on the weak side, giving Rubio options. Rubio keeps his eyes on Ingles but throws the no-look pass to Niang for three. Your Heads Up Play of the Day! 2012-13: Completed his second year in the NBA by appearing in 57 games (47 starts)… Made his first appearance of the year Dec. 15 vs. Dallas; he'd been sidelined for the first 20 games while recovering from surgery to repair a torn ACL and a torn LCL in his left knee…Also missed four contests (Dec. 29-Jan. 5) with back spasms…Averaged 10.7 ppg, 4.0 rpg and 7.3 apg while playing 29.7 mpg; he shot 36.0% from the floor, 29.3% from three-point range and 79.9% from the line… Ranked 2nd in the NBA in steals (2.40 spg), breaking the previous franchise single-season mark (2.17) set by Micheal Williams in 1992-93; he also finished 10th in the league in assists… Tallied a game- and career-high 24 points Apr. 13 vs. Phoenix, part of his 13th double-double this year and third 20-point/10-assist outing in the season's final month… Added five rebounds and five steals in that game, making it his sixth career 10+ point/10+ assist/5+ steal effort (fourth this season); Terrell Brandon (seven), Micheal Williams (three), Kevin Garnett and Stephon Marbury are the only other Wolves players to accomplish that feat… Scored the 1000th point of his NBA career Apr. 12 at Utah, and dished his 500th career assist Feb. 20 vs. Philadelphia… Picked off eight steals Apr. 3 at Milwaukee, tying the franchise record shared by Tyrone Corbin and Brandon; it also matched the NBA's single-game best for 2012-13 (KembaWalker, Nov. 10)… The five three-pointers and eight TOs at Milwaukee were both career highs; he sank 16 of his final 36 from beyond the arc (44.4%)… Tallied a game-high 23 points Mar. 30 vs. Memphis, the second time he led the Wolves across the board (pts/reb/ast)… Collected his first career triple-double Mar. 12 vs. San Antonio, racking up 21 points, 12 assists and a career-high 13 rebounds… Swiped six steals Mar. 6 vs. Washington, capping a run that saw him grab 43 steals in 10 contests, the most prolific 10-game stretch in the NBA since Ron Artest totaled 44 in 2002 (Jan. 19-Feb.12) and the 4th-highest total in the past 20 years… Chipped in five points and 10 assists in the BBVA Rising Stars Challenge on Feb. 15… Equaled his career high with 14 assists vs. Portland on Feb. 4; he dealt 10 of the assists in the fourth quarter, matching a franchise record he shares with Marbury and Pooh Richardson… Had his 2013-14 contract option exercised on Oct. 30. 2011-12: Made his NBA debut by playing in 41 games before suffering a torn ACL and a torn LCL in his left knee on Mar. 9 vs. the Lakers; he underwent reconstructive surgery on Mar. 21 and missed the Wolves' final 25 contests… Earned First Team All-Rookie honors and finished 2nd to Kyrie Irving of Cleveland in voting for the NBA's Rookie of the Year Award, equaling the best-ever showing by a Wolves player (Stephon Marbury, 1996-97)… Started 31 times, with Minnesota going 18-13; they slipped to 5-20 following the injury… Averaged 10.6 ppg, 4.2 rpg and 2.22 spg in 34.2 mpg, while leading all rookies (and ranking 6th in the NBA) in assists with 8.2 apg… It's the Wolves' highest per-game average since Terrell Brandon handed out 8.9 apg in 1999-2000; Marbury, Micheal Williams and Pooh Richardson are the only other Wolves players to average 8+ apg in a season… Shot 35.7% from the field, 34.0% (32-for-94) from three-point range and 80.3% (good for 3rd among rookies) from the FT line… Contributed 15 points and 10 assists in his final appearance (Mar. 9 vs. the Lakers), his 12th double-double on the year; that's the most by a Wolves player since Sam Cassell totaled 18 in 2003-04… Tied a franchise record by handing out 10 assists in the 1st quarter at Portland on Mar. 3… Netted 12 points and seven assists in the BBVA Rising Stars Challenge on Feb. 25, as part of All-Star Weekend in Orlando… Scored 14 of his season-high 22 points in the 1st quarter vs. Philadelphia on Feb. 19… Matched his season best with 14 assists Feb. 7 vs. Sacramento (also Jan. 8 at Washington), and swiped a season-high six steals twice (Jan. 18 vs. Detroit, Feb. 3 at New Jersey); he registered 3+ steals in a game 18 times… Led the Wolves in rebounds (a season-high eight) Jan. 30 at Houston, while scoring 18 points… Named January's Western Conference Rookie of the Month… Played 40+ minutes on five occasions, with a high of 46:27 in the Jan. 25 victory at Dallas. Began is international career on Spain's Under-16 team in 2005, winning a bronze medal at the 2005 FIBA Europe U16 Championships... Named MVP of the 2006 FIBA Europe U16 Championships after leading Spain to the gold medal... Averaged 22.3 points, 12.8 rebounds, 7.1 assists and 6.5 steals per game during the tournament, including two triple-doubles and a quadruple-double (posted 51 points, 24 rebounds, 12 assists and 7 steals in the championship game against Russia)... Named to the Spanish team for the 2008 Olympics in Beijing, where at age 17 he became the youngest ever to participate in the gold-medal game... A member of Spain's gold-medal-winning entry at the 2009 FIBA European Championships. 2010-11: Averaged 4.8 points, 3.2 rebounds and 4.1 assists in 42 games during his second season with Barcelona... Earned his first Spanish ACB League Championship following an 8-0 run through the playoffs... Handed out at least five assists on 15 occasions... Tallied a season-best 15 points to go with eight assists against Caja Laboral on 11/20... Averaged 6.5 points, 3.2 rebounds and 3.6 assists in 20 Euroleague games... Also led his Barcelona team to victories in the Catalan Cup, Spanish Supercup and Spanish King's Cup tournaments. 2006-07: Averaged 4.5 points, 2.6 rebounds and 2.6 assists in 43 games... Led the ACB league in steals, averaging 1.9 thefts per game... Saw his first action in Euroleague, appearing in 16 games and averaging 3.6 points, 2,4 rebounds and 2.8 assists... Following the season, honored with the 2007 Spanish ACB League Rising Star Award as well as the FIBA European Young Player of the Year Award, given annually to the best player in Europe under the age of 22... 2005-06: Made his Spanish ACB League debut on 10/15 at the age of 14, becoming the youngest player ever to compete in Spain's top professional league... Averaged 2.6 points, 1.1 rebounds 0.7 assists in 14 games during his rookie season... Helped his team to victories in the 2005 Cataln Cup Tournament and the 2006 EuroChallenge Tournament. 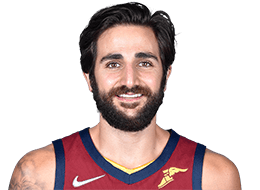 Born on Oct. 21, 1990... His parents are Esteban and Tona Rubio... Has an older brother, Marc, who also plays professional basketball in Spain's second division, and a younger sister, Laia... Lists Steve Nash as his favorite NBA player... Twitter handle: @RickyRubio9.